2010: One Life to Live's Cramer women reunited. 1965: On As the World Turns, the Cassens and the Hughes learned that Ellen Lowell (Patricia Bruder) had agreed to marry David Stewart (Henderson Forsythe). When Ellen told Claire (Barbara Berjer), Doug (Nat Polen), and Judge Lowell (William Johnston) about her engagement, they were shocked because they had been certain that she would marry Don Hughes (Peter Brandon). Doug even confronted David, accusing him of taking advantage of Ellen's love for her son, Dan. The Hughes also had been certain that Donald would marry Ellen, until he shared the news of the broken engagement at Grandpa Hughes's (Santos Ortega) birthday celebration. Ultimately, Ellen and David were the only ones who seemed pleased with the turn of events. 1974: On Another World, Lenore Moore (Susan Sullivan) told Steve Frame (George Reinholt) she was convinced that his wife, Alice (Jacqueline Courtney), still loved him. the family lived after the White House. 1979: Former First Lady Mamie Eisenhower died at age 82. She was also a devoted fan of As the World Turns. She had her staff schedule appointments before and after (but never during) the program. If for some reason she could not watch, she had a Secret Service agent take notes on the episode. White House staff, like J.B. West, learned to avoid her room when it was on or they'd be stuck watching it with her. As West said, "You can't just say, 'I'm sorry, I have more important things to do,' to a First Lady - especially Mrs. Eisenhower." First Ladies Betty Ford and Barbara Bush were also ATWT fans, as was President Jimmy Carter's mother, Lillian. 1982: Actor James Broderick died at age 55. He played roles in The Secret Storm, The Edge of Night and As the World Turns but was best known for portraying Doug Lawrence in ABC's primetime drama Family. 1982: On The Edge of Night, CEA agent David Cameron (Norman Parker) told told Mike Karr (Forrest Compton) and Derek Mallory (Dennis Parker) that Ian Devereaux (Alan Coates) was an international spy. 1985: On Loving, Curtis Alden (Linden Ashby) was tempted by Ava Rescott (Roya Megnot). 1985: On General Hospital, Robin (Kimberly McCullough) overheard Robert (Tristan Rogers) and Anna (Finola Hughes) saying they were her mother and father. 1988: On As the World Turns, Meg Snyder (Jennifer Ashe) lost her baby. 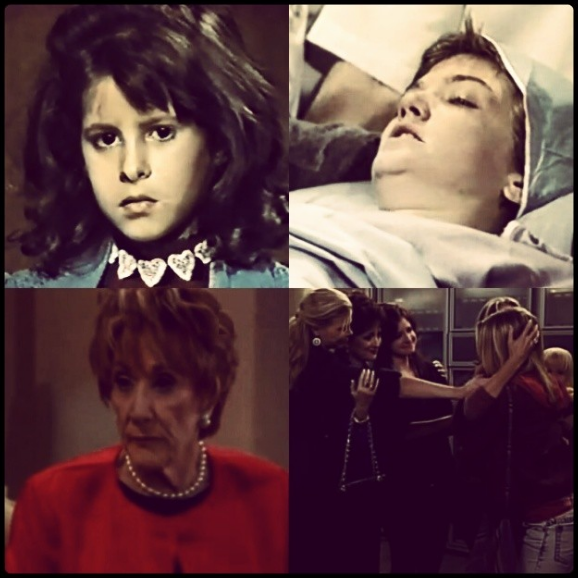 1990: On General Hospital, after breaking up Robin Scorpio (Kimberly McCullough) and her friends' seance in the catacombs, Felicia Jones (Kristina Wagner) went into labor. 1990: On Santa Barbara, Ric Castillo (Peter Love) left town. 1993: On General Hospital, after the truck carrying their friend explodes in front of their diner, Luke (Anthony Geary) and Laura (Genie Francis) left Lucky a message that Frank Smith had found them and to head to Port Charles separately. Luke and Laura left for LA on a freight train; while Lucky caught a plane to Buffalo. 1996: On Another World, Vicky Hudson (Jensen Buchanan) hosted a Halloween party. When the lights went out at Vicky's, Kirkland wandered around the attic and met a special friend (Paul Michael Valley's return to the show as Ghost Ryan). Jake McKinnon (Tom Eplin) and Bobby Reno (Robert Kelker-Kelly) battled for a kiss from Vicky as they engaged in an apple-bobbing contest. 1999: As the World Turns debuted a new opening sequence. The new visual sequence was designed by Pittard/Sullivan. The theme music was composed by David Nichtern and Kevin Bents. 2005: On The Bold and the Beautiful, Katherine Chancellor (Jeanne Cooper) revealed to Stephanie Forrester (Susan Flannery) that her father did not trust Stephanie's husband, Eric, hence the trust he set up making Stephanie the sole owner of Forrester Creations. Meanwhile, Eric suspected Stephanie broke into the safe and stole the trust. Later, Stephanie confronted Eric. 2006: On Days of our Lives, Kayla Johnson (Mary Beth Evans) flatlined. 2010: On One Life to Live, Blair (Kassie DePaiva) and the Cramer women reunited with Hope and Starr (Kristen Alderson). Actor Michael Zaslow (Roger, Guiding Light; David, One Life to Live; Pete, Love is a Many Splendored Thing) was born 72 years ago today. He died in 1998 at age 54. Watch some classic clips of the Emmy winner's soap work here. Zaslow has appeared in a number of our countdowns including 50 Greatest Actors, 50 Greatest Couples, and 25 Biggest Blunders.